This railway was the first to serve the beautiful verdant and fertile Eden Valley. The line connected the Cumbrian town of Penrith with the Westmorland market towns of Appleby and Kirkby Stephen. At Kirkby Stephen it formed a junction with the North Eastern Railway’s Stainmore Route giving access to Darlington and the North East. The Midland Railway’s Settle & Carlisle line came to the Eden Valley later, and the two railways crossed (and became physically connected to each other) at Appleby. The first regular passenger trains ran in 1862 and these continued for almost a century. But this was not the end of the story – the section between Appleby and Warcop was used into the 1980s to serve the Ministry of Defence depot. First published in 1997, this title has been long out of print. 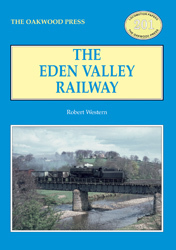 At t he time of the book’s original publication, the first signs of a railway revival in the Eden Valley were emerging. This new enlarged edition brings the story up to date and records the activities of both the Eden Valley Railway Trust (at Warcop) and Stainmore Properties (at Kirkby Stephen) and the return of trains to both locations in a new chapter ‘Revival’. A5 format, 128 pages, 122 illustrations.